Deepin (formerly Linux Deepin, Hiweed GNU/Linux) is an Ubuntu-based distribution that aims to provide an elegant, user-friendly and reliable operating system. It does not only include the best the open source world has to offer, but it has also created its own desktop environment called DDE or Deepin Desktop Environment which is based on HTML 5 technologies. Deepin focuses much of its attention on intuitive design. Its home-grown applications, like Deepin Software Centre, DMusic and DPlayer are tailored to the average user. 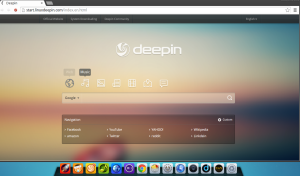 On July 6, 2014 Deepin released it’s LTS version with 5 years of support based on Ubuntu Trusty Tahr. It really is a beautiful OS.